Scholastic is also accepting eWallet as a form of payment. Please click here to purchase books online. Click here to find out more about eWallet. Parents, As a reminder, on STAAR testing days, please help ensure your child arrives on time to school. Also, there are no visitors or lunch deliveries on testing days to maintain an optimal testing environment with minimal distractions. We appreciate your cooperation. Just a friendly reminder that when we ask you to show your ID or leave it in the office for safe keeping during a campus visit, it is to help ensure the safety of all the students on our campus. Every child's safety is our very first concern! Please be sure that you bring a state or government issued ID with you any time you plan to visit our campus, attend a field trip, or sign your child in or out of school. If you are staying for a visit on campus, please be sure to wear your visitor's badge sticker in a visible spot near your face. This helps us to know you have signed in and are cleared to be in the building. The same will apply to other adults who are are on your child's approved emergency contact or pick-up lists. My favorite thing about teaching has to be Shared Reading and Read Alouds. I love the reaction I get when I act out the story using different expressions, tone of voice and sounds effects. Congratulations to Fredrick Clarke and Fredaya Clarke! 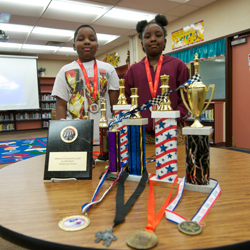 Fredaya finished 305th and Fredrick finished 324th out of more than 6,000 competitors at the Super Nationals Chess Tournament in Nashville, Tenn.